Smashwords Blog: Is Kindle Unlimited Bad for Authors? Amazon today unveiled Kindle Unlimited, following in the footsteps of Smashwords partners Scribd and Oyster. When I first heard of Kindle Unlimited, I was pleased. After learning more, however, I think indies should steer clear of it. As long-time readers of this blog know, I was initially skeptical of the prospects for a “Netflix of ebooks,” but I began to see the light as I examined the emerging business models of the subscription services. 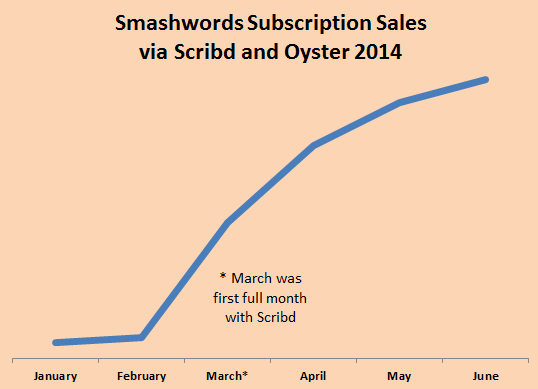 Now, several months into our relationships with Scribd and Oyster, I’m pleased to report these two ebook subscription services are the fastest growing retail channels at Smashwords at a time when industry-wide ebook sales are looking anemic. These services will bring more readers to ebooks and possibly even more readers to conventional ebook retailers (especially if more retailers offer subscription services too). I think Scribd and Oyster hit the nail on the head by creating services that balance the intersecting interests of readers, authors, the subscription service itself and the publishing industry in which we all operate. The same cannot be said for Kindle Unlimited. Indies would do well to avoid Kindle Unlimited for one simple reason: it requires KDP Select exclusivity. I’ve been speaking out against KDP Select ever since they launched it in 2011 when I wrote my post, Amazon Shows its Predatory Stripes with KDP Select. Amazon partisans have accused me of being an Amazon hater for my criticism of KDP Select, but that’s simply not true. I admire Amazon. Jeff Bezos and team are freaking brilliant. They deserve massive kudos for catalyzing the rise of ebooks, and for changing the lives of indie authors. But for all of Amazon’s good deeds, it does not mean we indies should kiss their feet unconditionally. Their business methods are not beyond reproach. We should encourage a healthy debate about Amazon’s practices and how they can do better for authors and readers. I can admire Amazon yet still oppose exclusivity. We should also recognize when Amazon’s business interests don’t align with author interests. KDP Select is a good example where the business interests of Amazon and authors diverge. Exclusivity is great for Amazon, but it’s not necessarily great for authors and readers. Exclusivity starves competing retailers of books readers want to read, which motivates readers to move their reading to the Kindle platform. This is why Amazon has made exclusivity central to their ebook strategy. They’re playing a long term game of attrition. Most indie authors recognize the value in fostering a diverse ecosystem of multiple competing retailing options. Yet every book enrolled in KDP Select is a vote to put Amazon’s competitors out of business. You know this to be true if you believe, as I believe, that indies are the future of publishing. Authors must weigh the benefits of KDP Select’s many enticing features against the alternative benefits of broad and diversified distribution. How do you measure what you’ll lose from either decision when missed opportunities are immeasurable? And is it the indie author’s responsibility to support Amazon’s competitors? Should an indie author feel guilty for giving KDP Select a try? I don’t envy authors who must make these decisions. Amazon forces these difficult decisions upon authors. It can take years to build readership at a retailer. Authors who cycle their books in and out of KDP Select will have a more difficult time building readership at Amazon’s competitors. Millions of readers prefer shopping at retailers other than Amazon. These other retailers operate in multiple countries (iBooks, for example, operates in 51 countries). These country-specific stores represent unique micro-markets of captive audiences not reachable via Amazon. Any time an author goes exclusive, they risk alienating fans who prefer shopping at other retailers, and they miss the opportunity for serendipitous discovery by new readers at other stores. They risk missing those times where lightning strikes and their books break out at different retailers at different times, often for reasons that can’t be identified. Authors who go exclusive at Amazon become more dependent (the opposite of independent) upon Amazon. Just as any financial adviser will advise you to avoid placing your retirement nest egg in a single basket, indies should think twice before locking their books into these three-month, automatically-renewing KDP Select contracts. With KDP Select, Amazon rewards authors who go exclusive and disadvantages authors who do not. That’s right, they’re punishing regular KDP authors who don’t go exclusive by denying them access to special sales and discovery tools like free promotional pricing, Kindle Unlimited and Kindle Owners Lending Library. These are great tools so it’s a shame Amazon doesn’t make them available to all authors without restriction. Amazon is creating a caste system within the Amazon store. Also worthy of note, as revealed by Publishers Lunch, it appears as if Amazon is paying traditionally published authors more for their participation in Kindle Unlimited than they’re paying indie authors. No other retailer creates such artificial restrictions for indie authors. Smashwords-distributed authors, for example, enjoy unlimited free pricing, greater pricing control, ebook preorders, broader global distribution and all without the handcuffs of exclusivity. It’s unfortunate Amazon is restricting access to Kindle Unlimited. It’s unfortunate they’re denying their customers access to the books of all indie authors who would otherwise participate if not for the exclusivity requirement. It’s unfortunate that Amazon forces indies to make such a choice. For indie authors who feel trapped in KDP Select, today’s announcement offers you a silver lining: you now have an out. Because Amazon automatically opted all KDP Select authors into Kindle Unlimited, they’re giving KDP Select authors the ability to immediately withdraw from KDP Select without waiting for their current three-month term to expire. The instructions, which are listed at https://kdp.amazon.com/help?topicId=AA9BSAGNO1YJH&ref_=pe_446610_120662130 , advise authors to contact their support team to leave KDP Select. If you’ve got indie author friends who are in KDP Select, now might be a good time for them to cast their vote against exclusivity. KDP Select would not exist were it not for the ongoing support of indie authors.